Usually, I don’t write reviews for books I don’t finish, but I have read HUNDREDS of pages of this novel, so I feel qualified to say a thing or two about it. Honestly, I should have stopped reading it a while ago, but just haven’t found another novel I want to start. I picked up this novel because the title is shared with one of my all-time favorite board games (Pandemic Legacy Season 2 is at the TOP of my Christmas list). Oh, and I love dystopian novels. So, obviously, I would love this book. Yeah, I really did not like this book. Part of me feels like being a writer ruins my enjoyment of books, since I take an author's perspective while reading. I can see the craft and architecture behind the story. I will give it to Mr. Riddle. He obviously did a ton of research for this book. However, just because you learned every detail about the molecular structure of a virus DOESN’T MEAN YOU SHOULD INCLUDE IT IN YOUR BOOK. There is a scene where one of the characters gives an entire lecture to her team on the scientific, nitty-gritty details of viruses. Now, I’ve read other books with professors giving lectures (I’m looking at you, Dan Brown), but usually these scenes are brief and focus on the interactions between the lecturer and the audience. Nope, in Pandemic you’ll get several research dumps about biology, WWII history, Nigerian politics, etc. My other big complaint: every character has an intricate backstory. Now, authors should have fully fleshed-out characters. However, just because you’ve pinned down each character’s nuanced life-story DOESN’T MEAN YOU SHOULD INCLUDE IT IN YOUR BOOK. Seriously, as tension is rising and characters are getting closer to stopping the virus, they go to a cabin, sit down, and read a journal containing the entire life stories of not one, but two, entirely new characters. Because when things get tense, the best reaction is to sit down and read about how William was orphaned—twice. One of the main story arcs follows Desmond, who woke up in a hotel room with no memories (and a dead man, the details of which never get explained). As the book goes on, he ‘unlocks’ more and more of his memories. I’m not a fan of the whole amnesia trope, and the memories he slowly rediscovers have no bearing on what’s going on in the main story arc. Another story-line follows a CDC employee who gets fired and buys an RV. I have no idea why he thought he needed an RV in the middle of a pandemic, because his story was neglected for the middle half of the book. After all this, you might ask why I decided to give this novel two stars instead of one. Well, I did want to give some credit for the well-crafted prose. I can see other readers enjoying Riddle’s style—especially fans of slow-burn historical dramas. 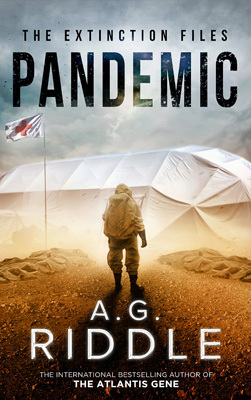 The slow pace and excruciating detail in Pandemic aren’t appropriate for a dystopian thriller. Originally, I had planned on loving this book and sharing that love by hosting a giveaway for a few copies. But… I’m not going to do that.